The strong, historical links between France and Aboriginal art offer a rich and fertile background – from the research and writing works of French ethnologists and anthropologists to the development of important public Aboriginal art collections in France and the exceptional Australian Indigenous Art Commission at the Musée du quai Branly in Paris. And this year, in partnership with the Alliance Francaise de Brisbane and the Embassy of France in Australia, the IDAIA (International Development for Australian Indigenous Art) further celebrates France’s embrace of Australian Indigenous art with its exhibition, Gestuelles. 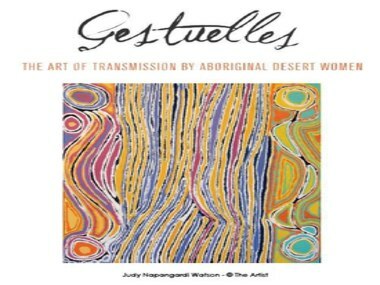 Gestuelles is a collection of artworks from Aboriginal women painters located in the same desert communities where the emergence of acrylic painting and the understanding of women’s role have been researched by two prominent French women anthropologists, Francoise Dussart in Yuendumu and Barbara Glowczeski in Balgo Hills. Originating from two historical Aboriginal art centres, Warlukurlangu Artists in Yuendumu – NT and Warlayirti Artists in Balgo Hills – WA, the body of works explores women’s painting and their gestures relating to transmission, from younger emerging artists to senior painters like international star, Judy Napangardi Watson. Gestuelles was first opened by HE Mr Stephane Romatet, Ambassador of France, in Australia’s capital, Canberra, in May (planned to coincide with the 2nd National Indigenous Art Triennial at the National Gallery of Australia). From there it travelled to Novatel Sydney on Darling Harbour where Lorraine Mercuri, General Manager of Novotel Sydney on Darling Harbour, said she was honored to host such an important exhibition, explaining, "Accor has strong links with the Australian Indigenous community thanks to our landmark Indigenous Employment Program which has provided jobs for over 800 Indigenous people over the past decade, and as a French company it is especially fitting that we should host this exhibition which celebrates the strong links between France and Australian Indigenous art. I am sure our guests and the public will enjoy the vibrancy and beauty of these artworks." Now Gestuelles has moved from Sydney and is travelling to Brisbane, its final stop, to coincide with the landmark exhibition we reported earlier at the Musée du quai Branly, ‘Tjukurrtjanu: Origins of Western Desert Art’ from the National Gallery of Victoria, celebrating the 40th anniversary of both the genesis of the acrylic art movement in Aboriginal deserts and the creation of one of the first Aboriginal art centres. It will run from 7 November to 5 December 2012 at the Alliance Francaise de Brisbane. The opening ceremony on 7 November will be at 6pm (til 8pm) with public and private floor talks led by Solenne Ducos-Lamotte.